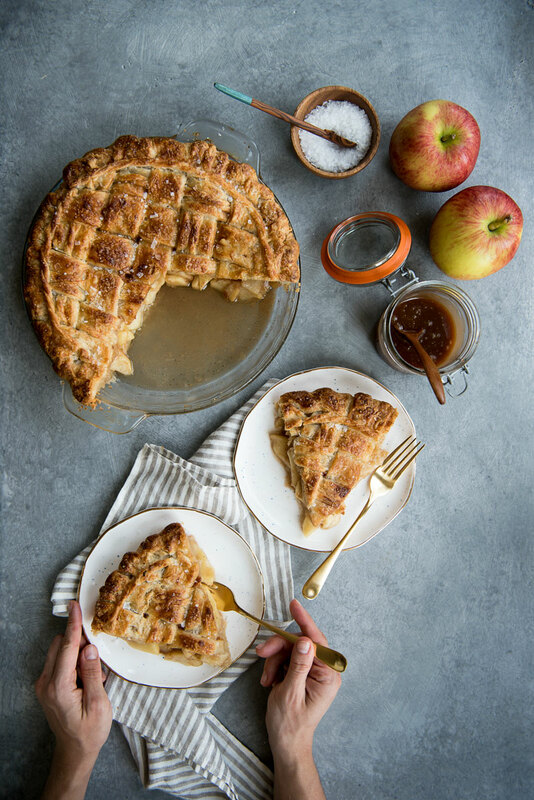 This recipe for Salted Caramel Apple Pie from scratch will blow your mind. The all butter pie crust recipe is flaky perfection. Oh boy do I have a treat for you today! I have been making pies for over twenty five years (yes, since age 5) and this might be the best pie ever. 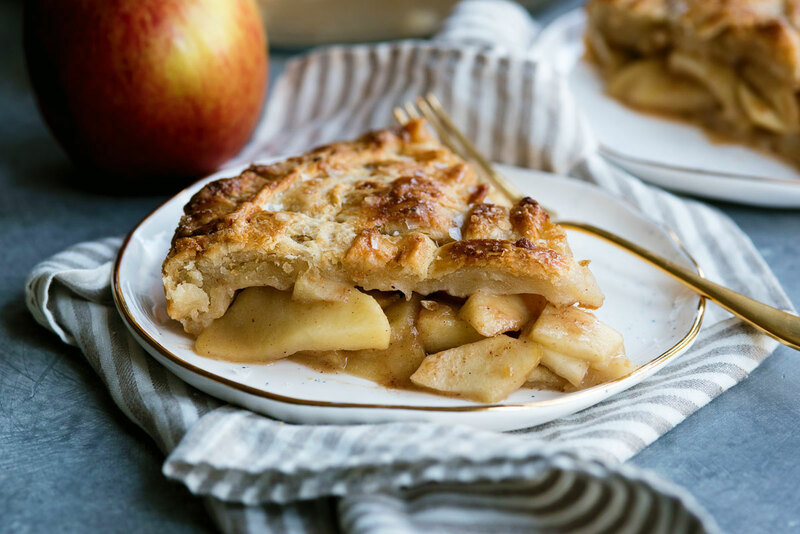 Today I’m sharing with you the recipe for Four & Twenty Blackbirds pie shop’s Salted Caramel Apple Pie. Making apple pie from scratch is one of my favorite things to do in the fall, but adding caramel just takes things to the next level. The recipe is from the Four & Twenty Blackbirds Pie Book, released by Emily and Melissa Elsen, the sisters and owners of the famous Brooklyn pie shop by the same name. The Four & Twenty Blackbirds Pie Book contains over sixty pie recipes organized by season – which I thought was great. Other than pumpkin, I typically don’t follow seasonal rules when making pies! Even in the middle of winter, I’ll grab a bag of blueberries from the freezer that I have tucked away from the summer. This book is full of unique pies to make all year long, like wild ginger strawberry and paprika peach. Each pie has its own beautiful photo to inspire you. Once I get started thumbing through the pages, it’s hard to put down! As soon as the book arrived, I flipped to the fall section and the Salted Caramel Apple Pie recipe caught my eye. This is one of the most famous recipes that Four & Twenty Blackbirds has created and is currently rated one of the top 20 pies in America by Travel & Leisure. I just knew I had to try it for myself. 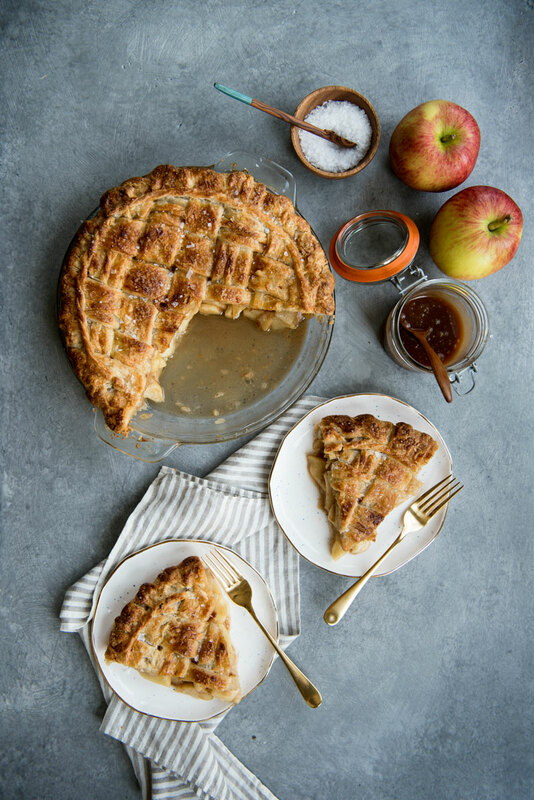 The result was incredible – mouthwatering with a perfectly sweet and flaky all butter pie crust topped with raw sugar and sea salt and filled with crisp and sweet apples and homemade caramel sauce. The recipe leaves a little caramel sauce left over, which is the perfect addition to a sundae – or just eaten by the spoonful (you better bet I’m guilty of this). 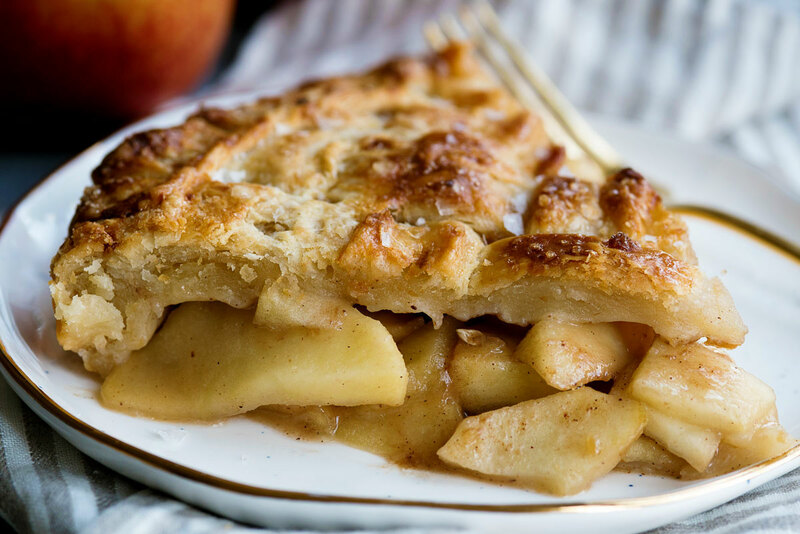 One of the most important components of a pie is the crust – duh! I’ve done and had them all – the lard pie crust, the lard and butter pie crust, the vodka pie crust, and this one tops them all. I tell you, I have seen the light. The all butter pie crust from the pie book topped them all. I also love that the crust recipe calls for a pastry cutter, not a fancy food processor or any other gadgets. It’s been a while since I used my pastry cutter and it was nice to do it the old fashioned way! Pat and I made quick work of the pie – between the two of us, it only lasted two days! It would have been one, but I made Pat wait until I had taken photos to dig in. 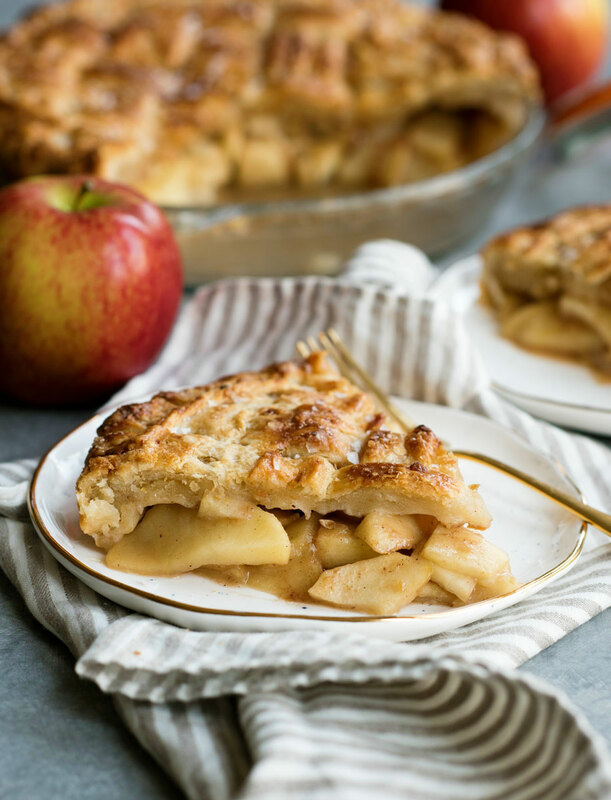 For this pie, I used my new favorite eating and cooking apple – the Sweetango, which is the prettier and sweeter sister of the Honeycrisp apple. I was really impressed with how well they held up in the pie and will definitely be heading to the grocery store to buy another bag before they go out of season. Another one of my favorite apples for making pie is Braeburn. They hold they shape well when baked which is so important! Avoid apples that get mushy when you cook them, like Macintosh. 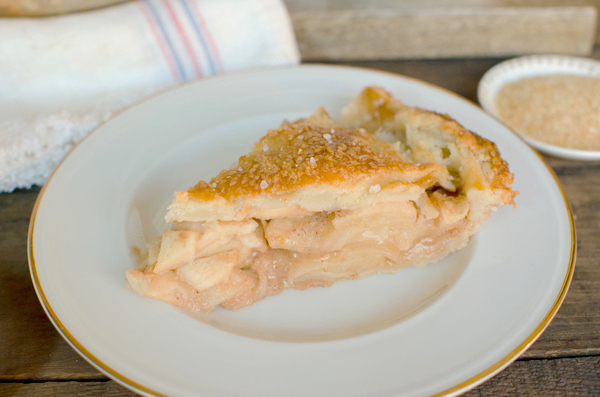 This recipe for Salted Caramel Apple Pie from scratch will blow your mind. The all-butter pie crust recipe is flaky perfection. Have ready and refrigerated one pastry-lined 9-inch pie pan and lattice strips to top (recipe below). Whisk together 1 cup of the granulated sugar and the water in a medium saucepan, and cook over medium-low heat until the sugar is just dissolved. Add the butter and bring to a slow boil. Continue cooking over medium heat until the mixture turns a deep golden brown, almost copper. Remove from the heat and immediately but slowly add the heavy cream – be careful, the mixture will bubble rapidly and steam. Whisk the final mixture together well and set aside to cool while you prepare the apple filling. Juice the lemons into a large mixing bowl, removing any seeds. Prepare the apples using an apple-peeling machine, or core, peel, and thinly slice them with a sharp knife or mandoline. Dredge the apple slices in the lemon juice. Sprinkle lightly with the remaining 2 tablespoons granulated sugar. Set aside to soften slightly and release some of the juices, 20 to 30 minutes. In a small bowl, sprinkle the Angostura bitters over the raw sugar. Add the cinnamon, allspice, nutmeg, black pepper, kosher salt, and flour, and mix well. Add the prepared apples to the sugar-spice mixture, leaving behind any excess liquids. Gently turn the apples to evenly distribute the spice mix. Tightly layer the apples in the prepared pie shell so that there are minimal gaps, mounding the apples slightly higher in the center. Pour a generous 1/2 cup to 3/4 cup of the caramel sauce evenly over the apples (use the larger quantity of sauce if you’d like a sweeter pie). Sprinkle with 1/4 teaspoon of the flake sea salt. Assemble the lattice on top of the pie and crimp the edges as desired. Chill the pie in the refrigerator for 10 to 15 minutes to set the pastry. Meanwhile, position the oven racks in the bottom and center positions, place a rimmed baking sheet on the bottom rack, and preheat the oven to 400F. Brush the pastry with the egg wash to coat, being careful not to drag the caramel onto the pastry (it will burn), and sprinkle with the desired amount of demerara sugar and flake sea salt. Place the pie on the rimmed baking sheet on the lowest rack of the oven. Bake for 20 to 25 minutes, or until the pastry is set and beginning to brown. Lower the oven temperature to 375F, move the pie to the center oven rack, and continue to bake until the pastry is a deep golden brown and the juices are bubbling, 30 to 35 minutes longer. Test the apples for doneness with a skewer or sharp knife; they should be tender and should offer just the slightest resistance. Stir the flour, salt and sugar together in a large bowl. Add the butter pieces and coat with the flour mixture using a bench scraper or spatula. With a pastry blender, cut the butter into the flour mixture, working quickly until mostly pea-size pieces of butter remain (a few larger pieces are okay; be careful not to overblend). Combine the water, cider vinegar, and ice in a large measuring cup or small bowl. Sprinkle 2 tablespoons of the ice water mixture over the flour mixture, and mix and cut it in with a bench scraper or spatula until it is fully incorporated. Add more of the ice water mixture, 1 to 2 tablespoons at a time, using the bench scraper or your hands (or both) to mix until the dough comes together in a ball, with some dry bits remaining. Squeeze and pinch with your fingertips to bring all the dough together, sprinkling dry bits with more small drops of the ice water mixture, if necessary, to combine. Shape the dough into a flat disc, wrap in plastic, and refrigerate for at least 1 hour, preferably overnight, to give the crust time to mellow. If making the double-crust version, divide the dough in half before shaping each portion into flat discs. Pro tip: If you are looking for the easiest way to roll out a pie crust, this pie board is the best $30 you will ever spend! Pie crust and apple pie filling recipe from The Four & Twenty Blackbirds Pie Book. P.S. 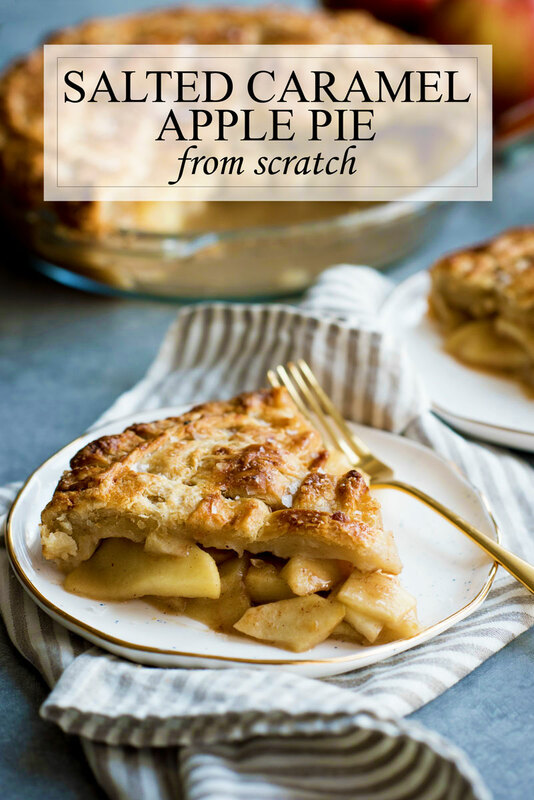 – This salted caramel apple pie recipe is updated from a post I originally published in October 2013. Here’s photo from the original post. It’s so fun to see how far my photography has come in the last four years! This looks sooo good! I can’t wait to make it! 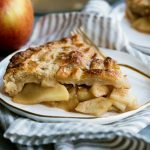 As you know we love pies on the http://www.pierate.co.uk blog, so I’m delighted you sent us the link to your blog entry on pie! Hope to one day get my hands on the book and enjoy all those delicious pies! Oh and my fav pie filling is steak! Steak pie! Amazing! That’s one I need to try myself! This looks so delicious. Love the pies, the caramel sound good. Pinning. Hooray thanks so much Ash! Apple is my favorite pie! I really want to win! I’d love to try these recipes! Wow, this looks so tasty! I love the classic lattice! Thanks so much Sara! I love the lattice because even if the pie crust isn’t perfect this hides any breaks in the dough. Omg. I feel like we could be besties! I’ve tried all the pie crust recipes toooo! And thought the vodka crust was the best. Can’t wait to try the all butter crust. 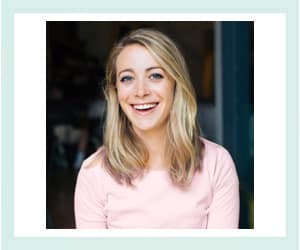 So glad I saw your blog! Ha! Too funny! Aren’t their pies amazing? My only sad thing is that I haven’t been to New York to check out their pies in real life! Thanks for sharing this amazing recipe. It turned out perfectly!